Builder Finance collects two types of information: Personal Data and Usage Data. Usage Data is information that, by itself, does not individually identify a specific person, such as browser type and operating system. Builder Finance generally does not treat Usage Data as Personal Data. We may, however, link together different types of Usage Data or link Usage Data to Personal Data. If linked information identifies (or can be used to identify) an individual person, Builder Finance treats the linked information as Personal Data. How and what information Builder Finance collects depends on how and why the Services are used. When You Provide Information to Builder Finance: Certain Services require you to provide information or create an account, such as when you submit a loan application. If you send us an email to team@builderfinance.com, we collect the email address that you use to contact us. We also collect feedback, questions and information that you provide to us for customer support. Through Server Logs: A server log is a list of the activities that a server performs. Builder Finance’s servers automatically collect and store in server logs your search queries, Internet Protocol (IP) address, hardware settings, browser type, browser language, the date and time of your request and referral URL and certain cookies that identify your browser. From Your Computer of Mobile Device: We collect device-specific information, such as your computer or mobile telephone model, operating system version, device identifiers and mobile network information. Through Service Providers: Third parties may from time to time assist us with our business operations. As part of their services, they may collect and use information (including Personal Data and Usage Data) through the Services and share the collected information with us. For example, our service providers collect and share information with us to analyze the performance of the Services, detect and prevent fraud or to improve user experience (including by monitoring how you use the Services). When you Connect with Social Media through the Services: Certain Services may link with social media platforms and social media plug-ins (e.g., the Facebook "Like" button, "Share to Twitter" button) (collectively, "Social Media"). When you connect using your Social Media accounts, we may collect the Personal Data provided to that Social Media service provider. Please review the privacy disclosures for your Social Media account to learn more about how Social Media account information is collected and shared with us. Analytics cookies, which allow Builder Finance to recognize and count the number of visitors, learn how visitors navigate the Services and improve the Services. Functionality cookies, which Builder Finance uses to recognize you when you return to the Services. Interaction cookies, which allow you to recommend Builder Finance on Social Media. Targeting and online behavioral advertising cookies, which OpenProperty uses to make advertising messages more relevant to you. They help ensure that ads are properly displayed for advertisers, select advertisements that are based on your interests and measure the number of ads displayed and their performance, such as how many people clicked on a given ad. Builder Finance also may use analytics services to collect Usage Data. Generally, analytics services do not identify individual users. Many analytics services allow you to opt out of data collection. You may opt-out from receiving targeted advertisements from AdRoll by visiting the NAI website here: http://www.networkadvertising.org/choices/ or the DAA opt-out page here: http://www.aboutads.info/or, for EU users, the EDAA opt-out page here: http://youronlinechoices.eu/. Do Not Track: Some web browsers (including Safari, Internet Explorer, Firefox and Chrome) incorporate a "Do Not Track" ("DNT") or similar feature that signals to websites that a user does not want to have his or her online activity and behavior tracked. If a website that responds to a particular DNT signal receives the DNT signal, the browser can block that website from collecting certain information about the browser’s user. Not all browsers offer a DNT option and DNT signals are not yet uniform. For this reason, many website operators, including Builder Finance, do not respond to DNT signals. Service Providers: Builder Finance shares information with Builder Finance’s distributors and suppliers and third-party service providers that help us operate the Services. Builder Finance enters into written agreements with each service provider that requires the service provider to protect your Personal Information. 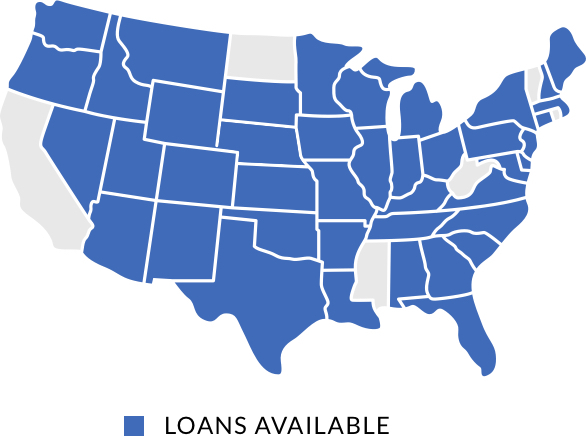 Lending Partners: When you apply for a loan through the Services, we share your loan application, including Personal Data, with co-lenders and our other lending partners. Corporate Transactions: Builder Finance may share and transfer Personal Data if Builder Finance is involved in a merger, sale, acquisition, divestiture, restructuring, reorganization, dissolution, bankruptcy or other change of ownership or control by Builder Finance or its parent or affiliated companies (in each case, whether in whole or in part). Other Lawful Disclosures: Builder Finance also shares information: (i) as required or permitted by law; (ii) if we determine that disclosure of specific information is necessary to comply with the request of a law enforcement or regulatory agency or other legal process; (iii) to protect the rights, privacy, property, interests or safety of Builder Finance or our affiliated companies, customers, employees or the general public; (iv) to pursue available remedies or limit damages; (v) to enforce Builder Finance’s agreements with you; and (vi) to respond to an emergency. Builder Finance deploys administrative, physical and technical safeguards intended to help protect information that we collect, process and store. Unfortunately, however, no safeguards or electronic data transmission are completely secure. Any transmission is at your own risk and Builder Finance expects that you will use appropriate security measures to protect your information. You are responsible for maintaining the security of your credentials and other authentication involved in obtaining access to password-protected or secure areas of the Services. Builder Finance will treat access to the Services through your credentials as authorized by you. Unauthorized access to password-protected or secure areas is prohibited and may lead to criminal prosecution. The Services are not directed to or intended for use by minors. Consistent with the requirements of the Children’s Online Privacy Protection Act, if we learn that we received any information directly from a child under age 13 without his or her parent’s verified consent, we will use that information only to inform the child (or his or her parent or legal guardian) that he or she cannot use the Services. California Code Section 1798.83 permits individual California residents to opt out of Builder Finance’s disclosure of Personal Data to third parties for their direct marketing purposes. California law also permits residents of California to request and obtain from us once per year, free of charge, a list of the third parties (if any) to whom we have disclosed Personal Data for their direct marketing purposes in the prior calendar year, as well as the type of Personal Data disclosed to those third parties. Please note, however, that Builder Finance does not disclose your Personal Data to third parties for their direct marketing purposes. Builder Finance is headquartered in the United States and the Services are controlled and operated from the United States. If you are using the Services from outside of the United States, you do so at your own risk and you are solely responsible for compliance with local laws.